* founded The Cincinnati May Festival in 1871, which continues today. The first woman in US history to start an annual music festival. 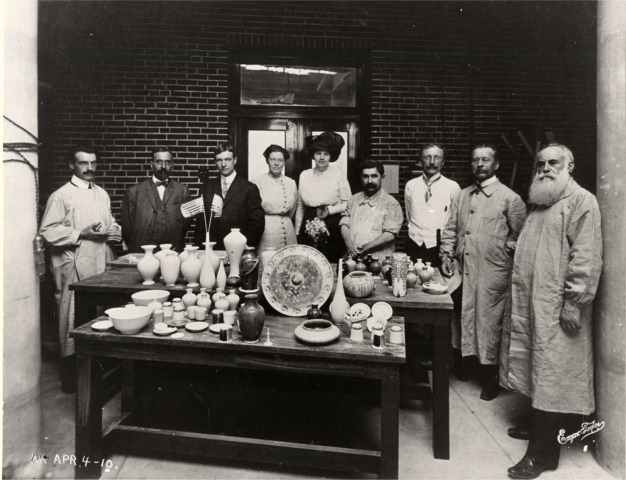 * one of the first women to exhibit their pottery at the first US held World Fair in 1876. * founded the Rookwood Pottery in 1879 with fellow female artist Mary Louise McLaughlin. * one of the first American potters to incorporate Japanese cultural art into their work. 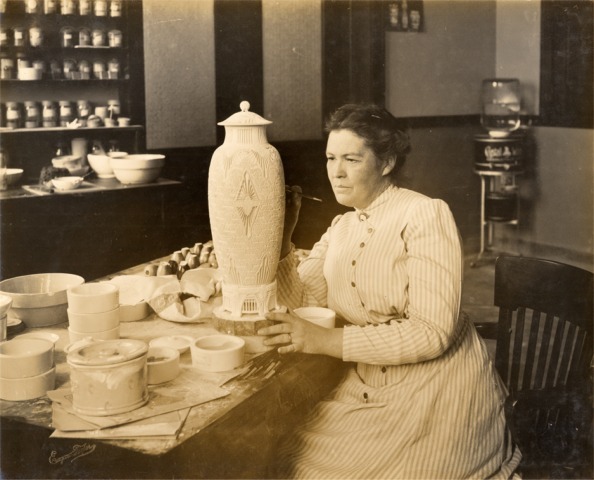 * in 1876, she became the first US potter to use the "underglaze" technique in pottery. She actually developed the technique that was a closely guarded secret of the Haviland Pottery in Europe. * wrote one of the first books on China Painting: China Painting: A Practical Manual for the Use of Amateurs in the Decoration of Hard Porcelain). * in the 1890's, she began producing porcelain fired pieces in her backyard: making her the first studio potter in the United States. The work of both of these women can be found at the Cincinnati Art Museum. Feel free to add your favorite artist/potter from our history, but please use the format shown. Adelaide Alsop Robineau (b Middletown, CT, 9 April 1865; d Syracuse, NY, 18 Feb 1929) was the publisher of Keramic Studio Publishing Co which began publishing the periodical for potters in 1899 up to 1919.She began making pottery herself shortly after that. Frederick Hurten Rhead(1880â€“1942) recruited Robineau and Taxtile Doat to teach University Art Pottery 1910-11.She was the first to publish Taxile Doat's treatise "Grand Feu Ceramics" into English. She taught at Syracuse University fro 1920-1929. After her death The Syracuse National Ceramics competition for initiated in her memory. The Everson Museum of Art in Syracuse has a great ceramics collection thanks to this long running competition. 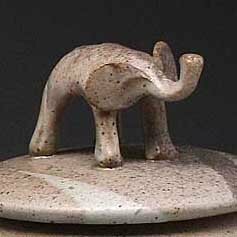 While she was working in St. Louis she created some of her best pieces including the Scarab Pot which took 1000 hour to carve. Thanks Marcia for adding it to your post, thought you would like it given the content of your historical piece. Guess I should have told the forum I had asked you about it in PM. Marcia: add the links to your post, and I will delete this one. Edit: just read the May 1902 edition of Ceramik Studio from the Smithsonian link..WOW.. The pieces they show are just show stoppers. Great link to look at one of the first pottery magazine published in the US. I also noticed it was labeled: " Adelaide Robineau Publishing" ...cool stuff. glazenerd, please do not ask or tell other forum users what to say, and how. There is no reason to be so controlling of a conversation. Please treat others like they are on equal footing as you, and can choose their own words. If Marcia wants to add a link to her comment, that's fine, but it's up to her. 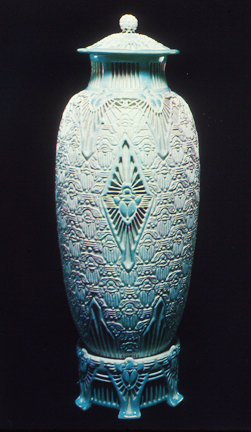 That scarab vase by Rhead is amazing. So many great potters I don't know about. The scarab pot is by Adelaide Robineau third photo.. She is carving it in the 2nd photo in my previous post.It cracked during the high fire. She repaired it and re-fired it. Here are some Herbert Rhead pots. His daughter Charlotte developed tube lining. Finer than slip trailing but similar. * considered by most to be the father of crystalline glaze. * one of the artist responsible for introducing the Art Nouveau style. * University Pottery fired the first "high fire" kiln in April, 1910. * wrote the Grand Feu Ceramics, which was published in 1905: which featured many of his newly discovered glazes. * Adeliade Robineau later translated this work into English for the US pottery market. * Heavily involved in developing porcelain clay into it's modern use. 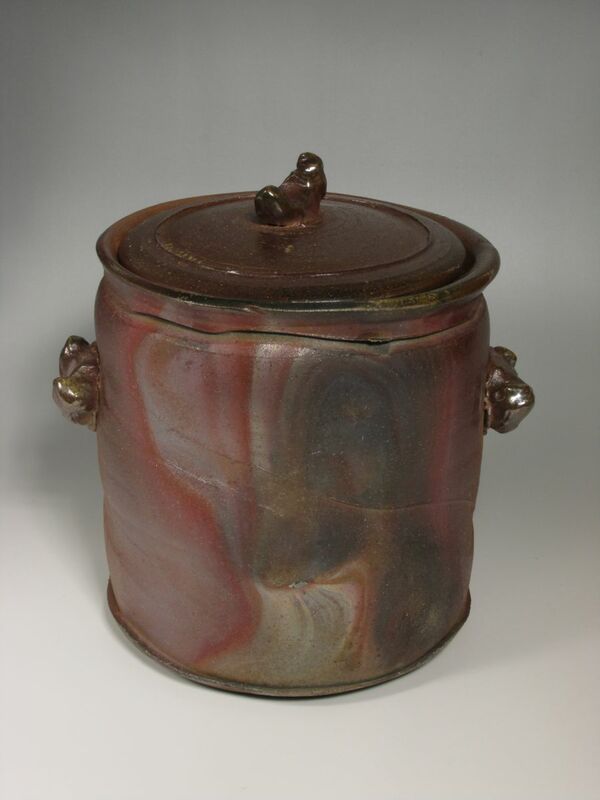 The profits from the University Pottery was used to support and fund the Women's Suffrage movement. Oldest known kiln dates back to 6000 B.C. Located in Yarim Tepe archeological site in modern day Iraq. Oldest known kiln usage dates back to 12,200 B.C. : known as Neolitic (Stone Age) kiln. It has been estimated that the top firing temperature of these kilns reached 1652F. Neolitic civilization occupied what is known today as the West Bank. Nice pieces, can understand why you like those five. Taxtile Doat tops my list for obvious reasons. 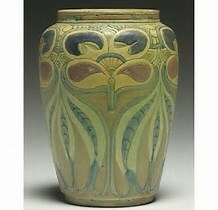 Although Mary Louise McLaughlin probably had more influence on American pottery than most. 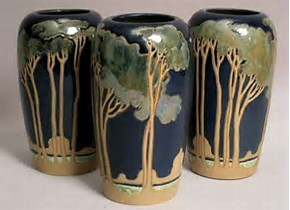 She single handily developed and introduced the " under glaze" technique into the US pottery scene. A historical event by my measuring stick. what about Yomon pottery in Japan? 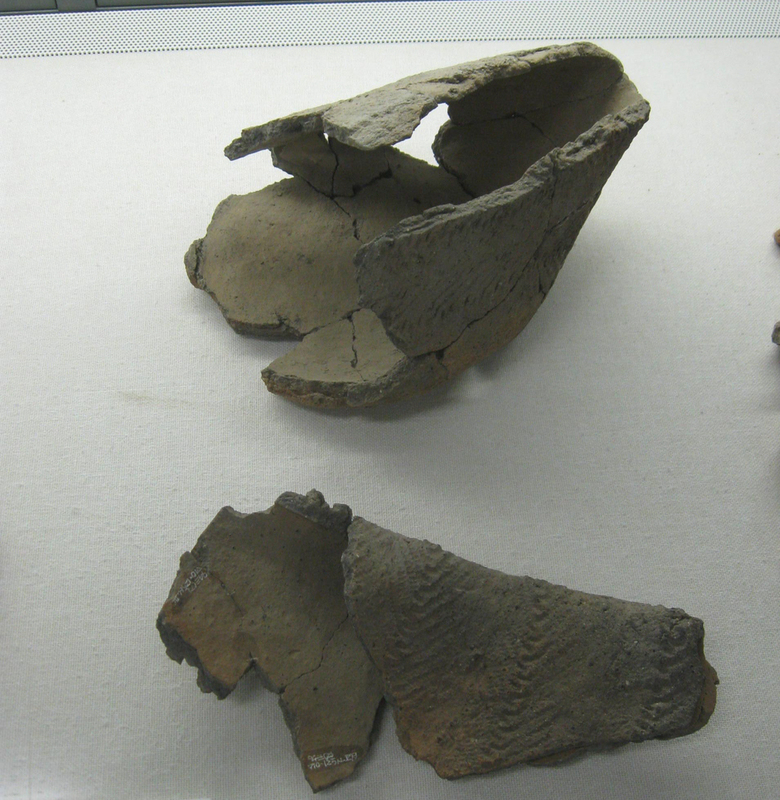 The first ceramics in Japan: Jomon Ware. 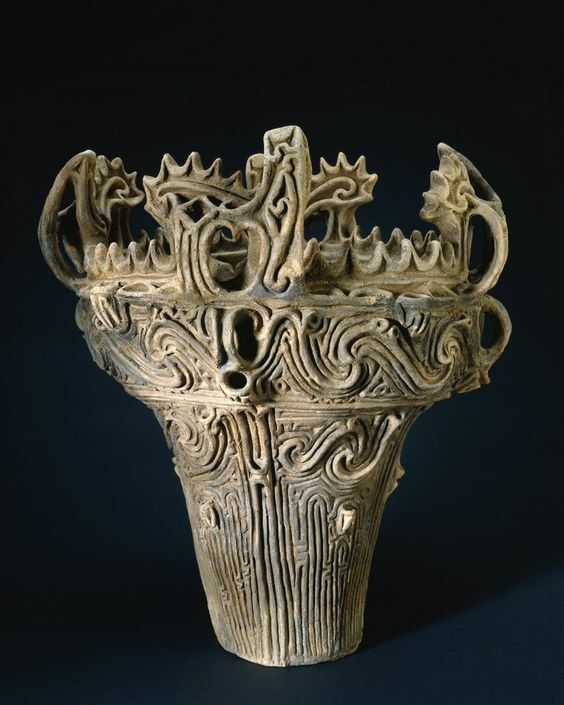 The very first examples of earthenware in the world were produced 12,000 years ago in the form of Jomon Ware, Japanâ€™s very first ceramic products. Various kinds of pottery were produced ranging from products rolled in straw rope to produce patterns to figurines. from the Final Jomon Period. PS I taught History of World Ceramics in three different Institutions. Um...... no. You're into my professional filed of study now. Incipient Jomon Jidai work in Japan dates back to between 15,000 to 14,000 BCE. 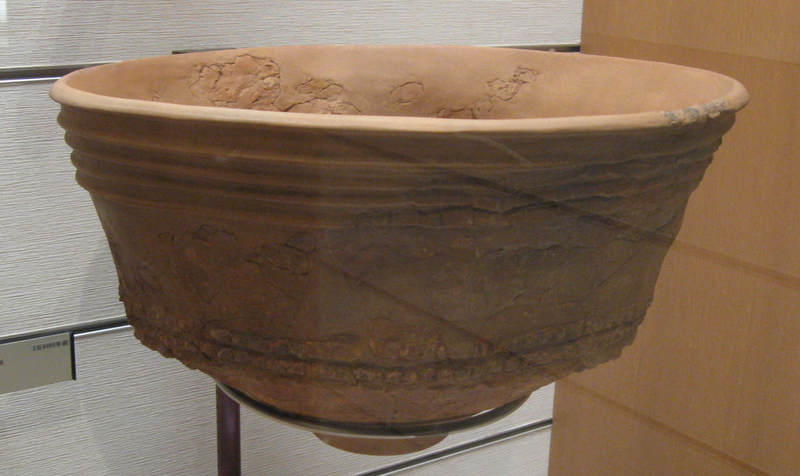 I'll post a picture I shot of the earliest Jomon pot found in Japan in Nigata-ken in a little while. Recently (reported in the USA in 2012 or so) in the People's Republic of China ceramic pot shards were found at a site in the Xianrendong Cave, in Jiangxi Province that are dated to 18,000 BCE. My mentor/friend/sensei in Japan has studied and researched the firing technique development of Jomon...... and they eventually used something that resembles what we might call a "paper kiln".... but using straw and mud not paper and mud. Here (below) is the oldest Jomon vessel (shards included in the re-construction... look carefully) found in Japan to this date. It is in the collection of the Museum Of Japanese History in Sakura-shi, in Chiba-ken. It is dated at between 15 ,000 and 14,000 BCE. Makes it about 16 - 17 thousand years old. Amazing to think of that. 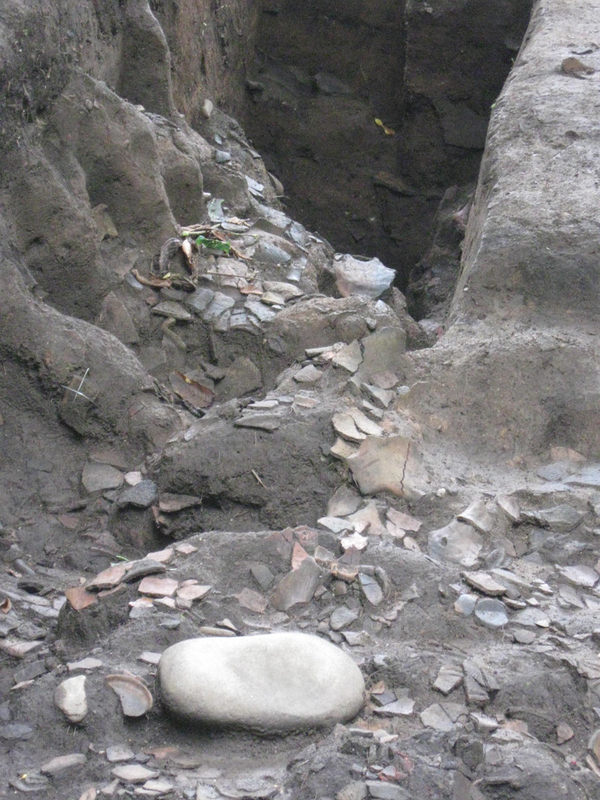 And as to the temperatures that the Jomon people were able to attain in their firings with very "primitive" and temporary kilns, it was enough to accidentally sometimes begin to soften/melt the clay they were using. Can't say the specific temp, but it has to be "up there" well above "normal" earthenware temps to do this. Notice the slight reduction coloration also........ which serves to make the iron in the clay start to be a flux and lower the melting point of the clay. Here (below) are some partially melted warped shards found in Aomori-ken at the Sannai Maruyama Middle Jomon archeological site (where I've been fortunate to do a little research on multiple occasions). 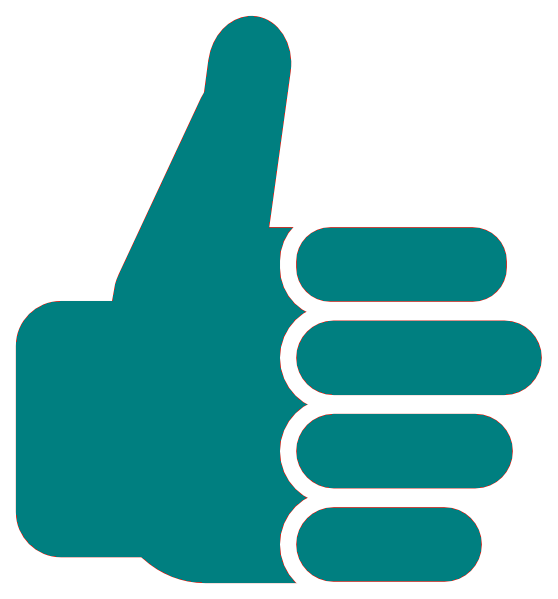 Guess I am going to have to post more often about your area of expertise; then I can look at some more historical references and pics. Really interesting glimpses into history. In all seriousness though, the usual online resources do not even mention these works in their record. I do not put much stock into them to begin with, usually referring more to the citations. Perhaps you should submit this information to Wikipedia. The Yarim Tepe site houses the oldest known ( in tact kiln) at 8000 years old: are you saying there are known kiln sites that are older? If so, maybe I will notify them myself; that is a fairly serious case of misinformation. I was part of an Anthropology group that presented recent research at the American Anthropology Association meetings "Current Research in Ceramic Materials dedicated to Frederick Matson, from Penn State who wrote Ceramics and Man . One research paper discussed using medical anthropology analyzing human teeth to determine when pots were introduced for cooking. The research was in Northern Japan. Interesting ideas. And much earlier than had been previously thought. That was in the 80s and 90s. As an hobbyist historian, bothers me when the record is incomplete. Going to look into a bit more over the coming weeks, but the citations on that piece I quoted from struck me as credible enough. Apparently there is a rather large gap from what I am hearing from you and John: which I also deem as being credible sources. Not the first time I have heard about using teeth to date, or get glimpses of lifestyle, etc. Always wanted to be involved in an archeological dig, but getting a little late in life for that dream... it will have to remain a dream at this point. when I wrote my thesis in 1973, much of my work was around Adelaide Robineau and Taxile Doat. My resource named the "Women's University" in St. Louis. Suffrgette era. I need to go look for my thesis and find that notation. can't find any mention of it now. It was on a level of Newcomb pottery at Tulane in New Orleans. A lot of mainstream art history (and history in general) that we in America and the West tend to see is "Eurocentric" in either focus....or in the sources that wrote the documentation of cultures in places like the Middle East. What happened (and is happening) in Asia is greatly ignored. For the longest time traditional art history made you think that anything significant done in art was done by dead white guys from Europe......... except for the cool mummies and such that dead white guys from Europe found in the Middle East. Primary sources in Japan are of course written in Japanese and tend not to get translated into English. Before I started spending a lot of time in Japan I used to think that Jomon pieces were kinda' rare. After all, it was really old stuff. In books, you always saw the same few pieces depicted. Surprise. Jomon sites in Japan are just about everywhere and there are an amazing amount of Jomon pieces that have been found. Here's (below) an example of the tons of Jomon shards that show up in a dig in many, many places in Japan. I have a number of shards in my own collection.... a couple found in fields just walking and some given to me by museums there (discarded museum items still with coding on them). Here's an aspect of Jomon that most will not be aware about, I think. In the Jomon Period the use of Urushi (the sap of a plant related to Poison Ivy) was known. It is more colloquially called "lacquer". Urushi is amazingly hard when cured and also resistant to temperatures that are involved in food preparation. it is waterproof. 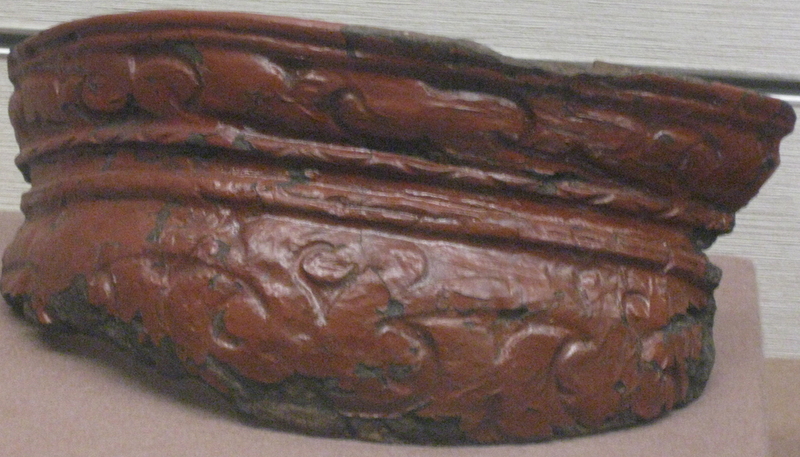 The Jomon people were firing po rous earthenware pieces..... but for some, they covered the porous clay with Urushi. Bingo! Pots that hold water (and other liquids) and are easy to clean. What today we might call "room temperature glaze" . Given the acceptance of the "room temperature glaze" as part of the potter's tool box in the Jomon time frame, why is the use of acrylic or other suitable polymeric coatings considered a no-no today? Why is it NOT? When used in an appropriate context and when there is "truth in advertising" as to the materials used....... why not? I was thinking more along the lines of pots used as part of the food / beverage functionality. Ron Nagle's 'cups' have a different 'function' than serving coffee or tea! And I like them very much. Many of his contemporaries moved from making table-ware to making salon-ware where the functionality was decorative and contemplation. With the coating technologies available now, there should be lots of interesting opportunities for composites of both interesting clay bodies along with traditional functions of the vessel. so why is the raku and low fire sagger crowd always told that there are no appropriate sealants when the Jomon potters solved that problem long before acrylic or polythene were invented? Here's an aspect of Jomon that most will not be aware about, I think. In the Jomon Period the use of Urushi (the sap of a plant related to Poison Ivy) was known. It is more colloquially called "lacquer". Urushi is amazingly hard when cured and also resistant to temperatures that are involved in food preparation. it is waterproof. 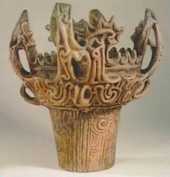 The Jomon people were firing po rous earthenware pieces..... but for some, they covered the porous clay with Urushi. Bingo! Pots that hold water (and other liquids) and are easy to clean. What today we might call "room temperature glaze"
The little I know about Urushi is that it was for centuries and to the present day used as a wood finish. 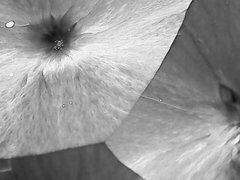 The idea is to apply many very thin layers to give it visual depth.